Amazing custom home like no other in Wexford! 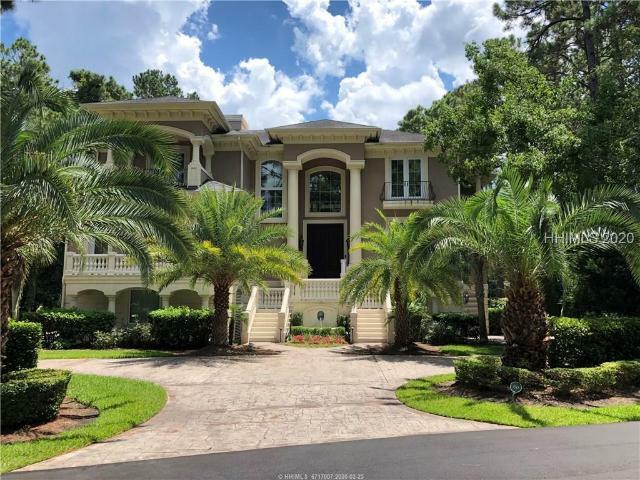 This luxury home sits on 2 harbor front lots at the end of a cul de sac, incredible landscaping and paver pathways meandering around the pool and gardens. Upon entering the home you are greeted by sweeping double staircases, crystal antique chandelier and hand carved stone columns from Mexico. Vaulted ceilings and soaring fireplace with Antique English bar in living room overlooking incredible panoramic harbor views. This 4 bedroom, 5 and 1 half bath home also features an eat-in kitchen, a pool bar with full bath in it, a large gathering room with hand hewn beams, dining room can large gatherings. Coastal home designed to enjoy the inside and the great outdoors! True custom finishes throughout, chiseled edge stone and wood floors, wonderfully appointed kitchen which opens to the family room, living room and views of the harbor. 6 bedroom suites, 7.5 baths, 8+ car garage, screened porch, raised invisible edge pool, 70GÇÖ private dock, terracotta tile roof, and so much more. If you are looking for a quality home that is ready to move into, this is it! 4 Years new and the one to see, the views are stunning & you dock your boat right outside. 2-story foyer open to great room with a wall of glass. Kitchen flows into a casual seating area & dining room. The open-concept plan is unified with richly grained hickory floors & a warm color palette. Master suite takes up one end of the 1st floor & boasts a paneled hall with a barrel-vault ceiling. Master bath is finished in veined polished marble & glistening mosaics. Media room is a cocoon from the world outside. 3-Br suites & sitting room on the top floor, a pool & lounging areas round out the entertainment spaces outside. 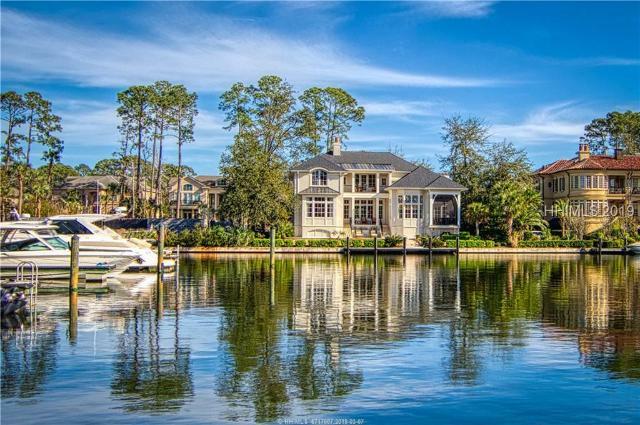 WATERFRONT LUXURY with private dock on the Harbour! Without question, one of the most sensational locations in all of Wexford! The setting and overall grandeur of this exquisite residence is beyond impressive, incorporating livability, comfort, and elegance! Designed in a purposeful & thoughtful manner that wonderfully ignites the scenes and opens the door to entertaining on a grand-scale. A residential masterpiece with drawings on file for a custom designed pool! Exceptional craftsmanship throughout, inclusive of newly refinished marble floors, dynamic ceilings, arched passages, spacious rooms, elevator, wet-bar & 4 fireplaces. This harbour front home is designed for enjoying life on and off the water. 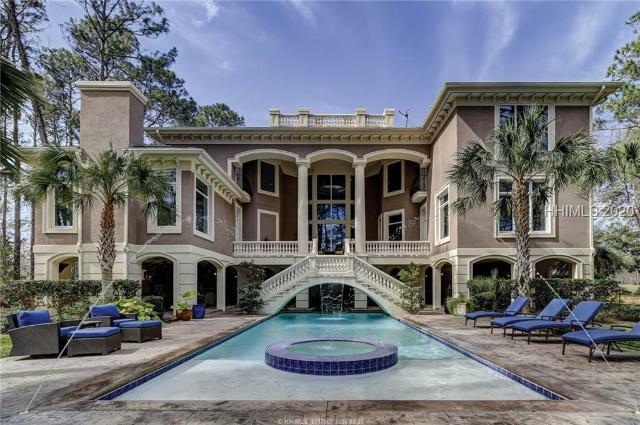 From the 50' private dock to the Wine Cave, Chef's Kitchen, Pool&Spa, Exercise Room, Craft Area, Elevator...to the Car Collector's 4 bay + golf cart garage w/ Swisstrax flooring, there is no end to the fun to be had in this home. It's architecturally elegant yet incredibly practical. A winding Charleston brick staircase leads to the front door, opening into a Great Room with coffered ceilings, Brazilian walnut floors and views of the Harbour. Butler's Pantry for entertaining. POA includes Club membership, golf and tennis. No other community like it. If you own a boat, are a car collector, play golf, tennis, or just want to live in a great community you should strongly consider living in Wexford. The dockage fee at any other marina on the island is equal to most of the home ownerGÇÖs fee in Wexford. In Wexford you get a whole lot more than just a place to park your boat; you get an incredible community and unparalleled lifestyle! Elegant first floor master suite, office, & chefs dream kitchen opening to the family room, 5 guest suite. Upstairs = home theater, billiard room, roof top sun deck. Elevator, 8+ car garage, pool side bar with gas fireplace, fitness room. If you own a boat, and play golf, tennis, or just want to live in a great community you should strongly consider living in Wexford. The dockage fee at any other marina on the island is equal to most of the home ownerGÇÖs fee in Wexford. But in Wexford you get a whole lot more than just a place to park your boat; you get an incredible community and unparalleled lifestyle! Quality & Breathtaking views. Overlooking the 17th green, and out to the marsh and Broad Creek. Thoughtfully designed and built with the highest quality, craftsmanship and materials. Wine room, granite, beautiful millwork, paver drive, 3 car garage, elevator, 1st floor master. The perfect open floor plan is masterfully showcased with top quality throughout this home. Gorgeous. Timeless architectural design coupled with a premium lagoon-to-golf view creates a stand-out property in this premier harbour community. Soaring ceiling drama and spanning glass culminate in achieving a sunlit ambience. No expense was spared in this true chefGÇÖs kitchen with two islands. Revel in a master suite done to the nines. Experience joy in entertaining with beautiful guest suites, two covered porches, enormous game/flex room, pool bath, outdoor fireplace and wet bar opening onto the pool and expansive deck. Must see to appreciate. This stunning home in Wexford Plantation boasts Quality, Location and Privacy. Located on the harbor, this home offers 3 bedrooms and 3.5 baths, elevator, custom wood paneled office, media room, and eat-in ChefGÇÖs kitchen. Gorgeous upstairs master suite with balcony & panoramic views of the harbor. Beautifully appointed and perfectly maintained-ready to move in and enjoy! If you are looking for a quality home on a great lot look no further. Panoramic harbor view, with 70 ft. private boat dock and private swimming pool. Extremely well-constructed; using concrete floor systems, steel beams, and Hebel Block. 5 Bedrooms, 5 1/2 Baths. Master suite on 1st floor with his & her walk-in closets, double vanity, shower & Jacuzzi. Kitchen with granite counter tops opens to breakfast area w/double sided fireplace. Family room has 2-story ceiling. 4 large guest suites, balconies overlooking the harbor. Other features include; saturnia floors, smooth painted ceilings, paver driveway, central vacuum, hot tub, spacious 3-stop elevator; the garage is a car collectors dream. Harbor views from most rooms. Private 70GÇÖ dock, and room for a pool! High quality, great value! Harbour Front Luxury Home. 5 BRs, 6 BA's, 2 Half BA's & 3 car plus golf cart bay garage. Gourmet kitchen w/granite counter tops, new cabinets, Wolf gas range w/built-in grill, 2 dishwashers, wine cooler & built in work/desk area. Living Room w/coffered ceiling, STONE fireplace & views over private pool to harbour. Separate dining room w/crystal chandelier. Large den downstairs w/English style bar & brick fireplace. Separate In-Law Suite with a full kitchen over the 3 car garage. Some features include: elevator, detailed molding, 4 fireplaces, Koi Pond. Beautiful multi level patio with private pool & heated spa and private dock. This unique harbour front home offers a courtyard style entrance to a bright, open & airy home in Wexford. The raised pool area is easily accessible from the family room with fireplace, office, and master suite. Eat-in kitchen open to the family room, there is also a separate dining area. First floor master suite with adjoining study. One guest suite on the 1st floor, plus spacious bonus room over the garage. The 2nd guest suite is located upstairs. Private 70GÇÖ boat slip in your back yard. Beautifully updated and ready to move in and enjoy. Includes Wexford amenities; Golf, Tennis, Boating, Social, and Dining, & 24 hr. security. Waterfront! Bring your boat and dock it at your private slip of this beautiful 3696 sq ft 3 bedroom 4 1/2 bath luxury home plus office and bonus room. You will love the views of the harbor from multiple rooms while entertaining your guests. Enjoy the wrap around deck with pool and hot tub. Three car garage with plenty of storage! A must see home! With over 4900 sqft, this home sits on the 12th fairway of the beautiful Wexford golf course. Lots of outdoor living space to entertain with your own private pool and spa, large decks and a 20x20 screened porch with a grilling area and gas fireplace. 2 master suites - upstairs suite has large double walk-in shower and coffee/beverage bar. Lower level suite walks out to pool, has steam shower, double vanity and large walk-in closet. All interior freshly painted and wallpapered. New roof and pool heater in 2017 and all 3 heat pumps under 5 years old. Owner is SCREA. See 3D VT link. NEW NEW NEW, everything is new!!! In 2016 this home was literally taken down to the studs... new stucco, new kitchen, new bathrooms, new ceiling, new floors, new windows, and new doors. A pool was added, a man cave was added with a fireplace, bar, shuffleboard and sauna, and new landscaping and grass. If that wasnGÇÖt enough, this home is situated with fabulous views of the Arnold Palmer Signature golf course's 15th green and lagoon as well as the 16th tee box and lagoon. If you were thinking of buildingGÇªstop! This 4 bedroom, 4.5 bath home has it all! !